PV, Wind, and Diesel Hybrid system providing basic power requirements for the rural village of X-Calak. Power is provided to 80 homes, 4 restaurants, and one 20 room hotel. The PV and Wind system was integrated into the existing diesel generators which amounted to 125 kW. 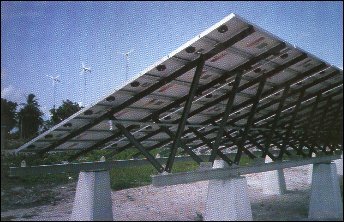 The PV/Wind hybrid system has aided to stem urban immigration from the village and helped to promote the local tourist and fishing industries. This project was successful in showing the viability of the technology for village power.